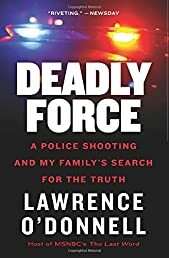 Deadly Force: A Police Shooting and My Family’s Search for the Truth	by Lawrence O'Donnell Jr.
From the host of MSNBC’s The Last Word with Lawrence O’Donnell, the riveting story of a 1975 police shooting of an unarmed black man in Boston—one of the first to draw national headlines—and the dramatic investigation and court case that followed. On a rainy winter night, James Bowden, Jr. left his mother’s house in Roxbury after a visit. As he guided his Buick out of his parking spot, an unmarked police car suddenly blocked his path. Two undercover officers sprang out, running toward his car. Shots were fired, and Bowden slumped over the wheel. Moments later, he was pronounced dead on arrival at a nearby hospital. The police argued that they had fired in self-defense, claiming that Bowden was an armed robbery suspect and that after they had ordered him to stop, he had fired a shot at one of them. And multiple internal investigations by the Boston Police Department exonerated the officers involved. But Patricia Bowden, James’s widow, knew better. “The truth will come out,” she said at her husband’s funeral. She sought a lawyer willing to take on the Boston Police Department and finally found one in Lawrence F. O’Donnell, the author’s father, a man whose past, unbeknownst to Patricia Bowden, made him the only man in town who could not refuse her case. O’Donnell embarked on a highly contentious three-year battle with the Boston Police Department to win justice for James Bowden. More timely now than ever, Deadly Force is a powerful indictment of police misconduct, a reminder of this issue’s long, tortured history and of how far we still have to go.